I can’t remember who came first in my life- dogs or horses. I do know a few of each are required for my mental health. There is a slow and gradual changing of the guard, as years go on. Three dogs and 13 years ago, my cattle dog, Hero and I were pretty depressed after losing our old dog, Spam. The moping around was wearing on us, so we signed up for Dog Agility class and called it date night. I’d been to obedience classes with other dogs- but this was different. It was happy training with obstacles and lots of rewarding, and my dog remained responsive outside of class. It was like paying a quarter and getting back 75 cents in change. Work felt like play! The next two dogs felt the exact same way. When I heard about horse agility, it was a no-brainer. Why shouldn’t horses have the same fun dogs do? Disclaimer: Early on I didn’t do much ground work with horses. I labeled myself a rider. The more I work with horses, the more I am aware that the quality of ground work directly reflects the work in the saddle. (Folks who pull on horse’s faces, do it with lead ropes as well as the reins for example.) Horses don’t label us- they only care about relationship. Mounted or in hand, it’s the same to them. Koda and Rosie in the pool. 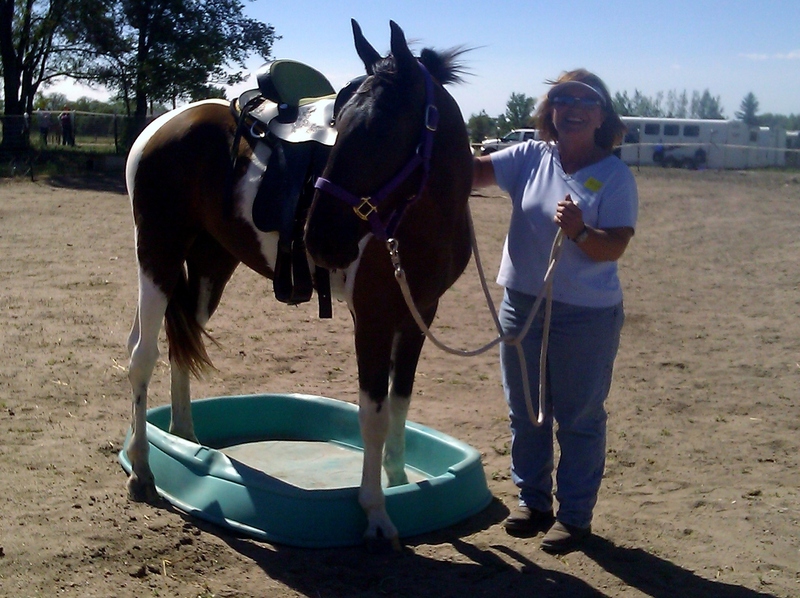 Horse agility is always done in hand and that makes it very inclusive. Everyone is suitable; young or old, untrained or retired, or just your best friend with hooves. Or long ears. But here is the kicker: just like dog agility, the goal with horses is to work off lead. That is a goal we should all work for because of the mutual confidence required. Like other liberty work at its very best- horses should be encouraged to volunteer behavior, without bullying. I would love to see this sport in the Olympics. I can recommend a great book, The Horse Agility Handbook by Vanessa Bee- even if you never try agility. The author’s explanation of groundwork is very fresh and understandable. And she is funny (to me at least) as she finds a few dozen ways to repeat the most common problem in every situation- going too fast. This book is great for the Parelli-challenged. What does horse agility have to do with Dressage? Everything! Both disciplines look for a light, willing response. Work in hand is a time honored tradition in Dressage, and we can all benefit from the opportunity to school ourselves in patient finesse. If the truth be told, some of us in Dressage struggle with HDD (Humor Deficit Disorder) and it’s a chance to giggle like horse-crazy girls. I do have one complaint: the word obstacle makes each stop seem like a problem instead of a game.That promotes obstacle blindness, where we focus too much on the result and not enough on the process. Better to see the obstacles as an Amusement park; let’s get the all-day pass and go on every ride! The last obstacle on the course was the apple bob. Can you imagine how much fun that was? Communication is exactly that: wondrous and fragile. And some of those horses are over-ridden. But I have had the joy of dancing with a horse (certainly not that well, or on that caliber of horse) that I have trained for years and years. Dressage is the best and the worst.